Farm auctions are one of my favorite places to search for prepping tools and survival gear. I frequently hit yard sales and flea markets for inexpensive preps, like sheets and curtains to turn into fabric, fishing gear, and boots with some life left in them. But, for the big stuff you will need to keep a survival retreat running during a long-term SHTF event, a farm auction is where you need to go. Twice each year there one of the largest farm auctions in the entire country is held in my state. Not only is the week-long event a farm auction it is an Amish farm auction. Folks from around the country save up all year so they will have plenty of money to spend on old-fashioned manual tools, farm equipment, and well-trained livestock at the Mount Hope Auction. The farm equipment sold at Amish and often even at auctions held at old farms in rural areas, was designed to be pulled by horses or is hardy and simple to fix. Being able to work on equipment without special tools or high-tech gadgets will make it far easier to keep it running when you can no longer call in a mechanic or shop for parts online. There is almost always something every member of the prepping family will get excited about when attending a farm auction – including the kids. The auctioneer will be selling far more than large farm equipment on the block during the events. You should expect to find homesteading and off grid kitchen items, heirloom toys that often help teach farm skills to youngsters, and a plethora of gardening items of all types. This is a Ford 2N tractor, circa about 1940. It is extremely rare. My husband got it as part of a combo deal. This old rusty beauty was billed as a “parts tractor” but after working on it for only an hour or so, it was up and running perfectly. There will be tractors of all shapes and sizes at farm auctions. You must do your research before you go in order to not only get a good deal, but to find a model that spare parts are likely to be easily found in your area – or fabricated in your survival retreat homestead workshop. 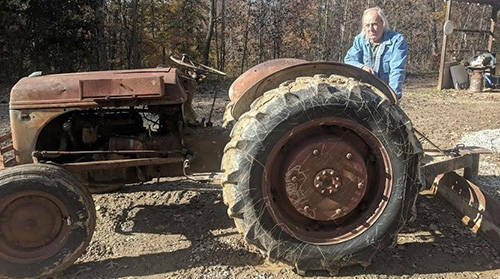 If you do not need a tractor but know what is a rare find or in high demand, you could score either a barter item or a tractor you could resell at a higher price to fund the purchase of other preps or survival gear that you are currently lacking. 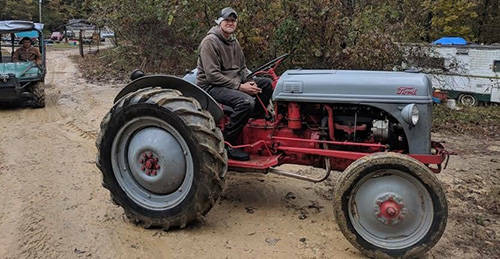 This tractor is a Ford 9N. Although it is not as rare as the rusty beauty shown above, it was still an awesome find. 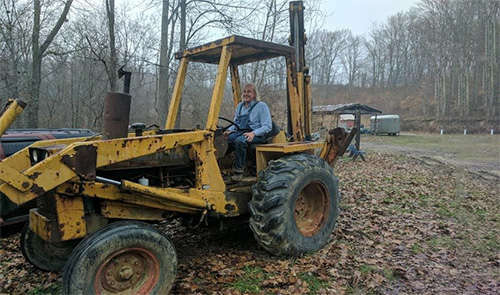 My husband scored both tractors for about $1,200. If you are going to keep medium and large livestock as a protein and milk source during a long-term disaster, they will need hay to prevent them from starving during the winter months. Having hay delivered to your survival retreat will not be possible when the world as we know it has either temporarily or permanently come to an end. The hay baler shown above and the rake attachment featured below, are just a few examples of the type of baling equipment you can commonly find at farm auctions. At an Amish farm auction, you can also find hay balers that can be pulled by a horse team. If you are really lucky, you might also find horse drawn logging equipment, as well. Yes, you can even find row boats, canoes, and sometimes even amphibious vehicles, as farm auctions. Make sure to pay attention to the fast-talking auctioneer when he details the water worthy nature of the craft. If you are handy, perhaps you can cold weld a bad spot on an aluminum boat, but you need to know how much work the fixing up will entail, before bidding. 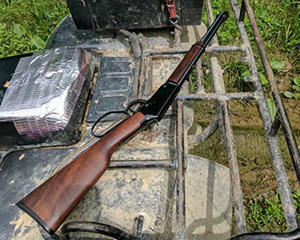 The availability of guns at a farm auction may vary but state, but it is not unusual to find quality hunting rifles at such sales. Before you can collect the gun at the auctioneer table you may have to submit to a background check. Farmers often have older, but still in decent shape, heavy equipment at their sales. Common types of heavy equipment found at farm auctions include backhoes, skid steers, track hoes, and dump trucks. 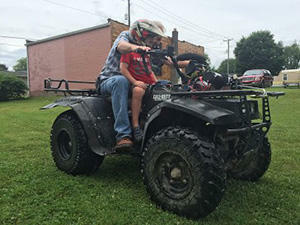 Four wheelers and side-by-side ATVs are nearly as common on farms as horses. Farmers use the all-terrain vehicles to haul feed, square hale bales, to pull logs, and to hook a winch to for a series of heavy-duty work. Farmers often butcher their own meat and possess not only stainless-steel tables and sinks to work upon, but both electric saws and special knives to complete the process. Unless you are going to become a professional butcher on the side to earn extra money, you do not need a separate building to butcher the meat you raise or hunt on your own survival retreat. In the photo below you can see how easily a common attached garage can be converted into a butchering area. Farm auction are also great places to score bulk produce. You will not likely be permitted to personally inspect each numbered tub that is placed up on the auction block during the sale, but it is common to be able to browse a trailer full of filed produce tubs before they are sent up for bidding. Some of my best cast iron pieces were purchased at farm auction. One skillet is capable of holding about 10 hamburgers and is in excess of 100 years old. Do not let a little bit of rust, or even a whole lot of rust, on a piece of cast iron, deter you from bidding on the item. It is virtually impossible to ruin cast iron. When I find cast iron that is heavily rusted, I simply put the sanding bit on my husband’s power drill and use it to remove the unwanted residue, and then wash it away before re-seasoning. Although finding old-fashioned manual tools is one of the reasons my husband and I hunt through farm auction listings so frequently, we also pick up cheap power tools that still have enough life left in them to use as backup tools or for barter. Manual tools to be on the lookout for at farm auctions include: potato mashers, manual drill and bit set, cheese press, juicers, two man saw, meat slicers, coffee grinders, and anything that could be used in an off the grid kitchen or workshop. Also, can you ever really have enough hammers and nails? We often buy miscellaneous cans full of nails, screws, and other hardware at farm auctions and have never once been disappointed while sorting through our “treasures” later. I believe our Mason jar “collection” is now up to about 5,761. Seriously. You can use the jars and rings over and over and over again. During a long-term disaster you must preserve all of the groceries you are growing and raising by canning, smoking, dehydrating, pickling, or salting. A farm auction is a superb place to find food preservation supplies in perfectly good shape. I shy away from buying even unused boxes of lids (unless they are super-duper cheap or part of a larger grouping of items) because the rubber on the lids could have cracked over time and not seal properly. Even if you do not keep large or even medium livestock on your prepper retreat, a bargain livestock trailer could still come in quite handy. A small trailer can be turned into a heavy-duty predator proof chicken coop, be used as a portable tool shed, as an attachment to a bugout vehicle to haul any number of items, including crops grown in portable containers. Utility trailers, or even hay wagons, are typically found in great abundance at farm auctions. 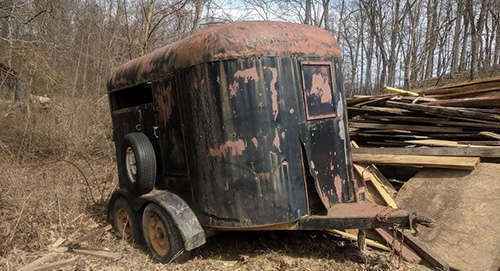 A trailer could be used not only to haul good on or off the survival retreat, but could be turned into a mobile greenhouse, portable livestock pen, or upcycled into a camper style living area. Buying animals at a farm auction can be easy on the wallet, but I advise doing so only with caution. Most farm auctions are set up by reputable sellers, folks who have care for their horses, cattle, hogs, chickens, goats, ducks, and turkeys quite well. But, when farm auctions are hosted by larger and more commercial interests and allow members of the public to sell their livestock as well, the health checks of the animals might sometimes be lax. 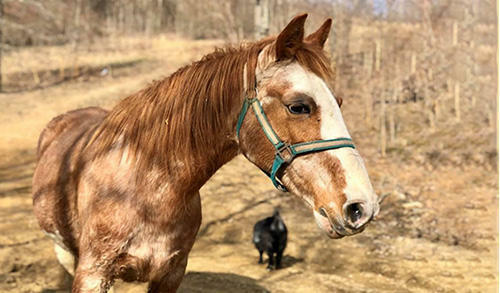 Unless you are familiar with the farm owners, breeders, or traders, you could run the risk of buying a sick animal or one that has “been doped” so it appears calm and manageable in the auction show ring. This list is solely featuring the 15 most beneficial and common prepping items most often included at farm auction. It is by no means an exhaustive list. You will surely find dozens more quality and affordable, and even hard to find, homesteading, survival, and off grid living supplies at farm auctions in your region. Using a WENCH this way is i’m sure illegal. Most readers would be surprised how many times “wench” is used in place of “winch”. There is a significant difference. That’s why correct word usage is important. Some like to scoff at correct word usage and grammar, but those fine distinctions are what make English the universal language that it has become. It is an incredibly rich language with more words than many other languages. It is too bad that the computer seems to have considerably dumbed it down — that and the failure of schools to concentrate on the study of English and grammar in an effort at political correctness. I’m not one of those readers and do understand the difference. Call a woman who has a vocabulary that term and you’ll likely be corrected, slapped, or kicked, LOL. That’s why correct word usage is important. Some like to scoff at correct word usage and grammar, but those fine distinctions are what make English the universal language that it has become. I wholeheartedly agree and I am often deemed the ”Grammar Nazi” since proper grammar and pronunciation as well as verb tense should be important. When I hear some supposed subject matter “expert” in the media say something like “We was there” or used the word “Eksetera” instead of the proper Etcetera (etc.) I often cringe and sometimes wonder about how correct the information they are discussing may be. I really had little choice in the matter since I grew up in the 50’s and 60’s living next door to my maternal grandfather who was a high school math and English teacher, back when spelling and grammar still mattered. ”Ain’t” was a forbidden four letter word in our household. It is an incredibly rich language with more words than many other languages. It is too bad that the computer seems to have considerably dumbed it down — that and the failure of schools to concentrate on the study of English and grammar in an effort at political correctness. I don’t know that you can blame computers, since most word processors do a decent job of spelling and grammar correction if one pays attention. As for political correctness, I think it is more apathy, since I know of some elementary school teachers whose grammar is horrible; but, they are still teaching. Computers have however made cursive writing (and reading) somewhat anachronistic. 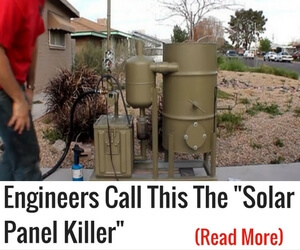 As an Engineer, I always tried to be precise, since lack of precision can keep something from working properly, sometimes with deadly consequences. 737 Max anyone? I surely hope that doesn’t apply to you. I have to take the contrary position that in an EOTW situation, illegal will still have meaning and perhaps more sever consequences than presently. While waiting for grand juries to return an indictment or no bill, I used to read Cal Reporter. CA Repts. is a compilation of California Supreme Court decisions from the founding of the state. In an early volume there is a report of a case originating from this very county. The defendant was found guilty on Wednesday of stealing a barrel of flour with a value of more than $200. He was sentenced that very day and the sentence was carried out early in the morning of Saturday of that week. The CA Supremes at that time only commented that the execution of the sentence seemed a bit hasty but otherwise upheld the conviction, sentence and execution. In an EOTW situation, I submit that murder and stealing will still be crimes. Certain code violations such as requiring an employee to do some tasks that were not in his job description at the time of hiring will certainly go by the wayside but basic crimes against person or property will continue to be crimes and where the criminal is apprehended by citizens, justice will be swift and sure. We won’t have the Noh drama that passes for the criminal justice system that presently exists, especially in the PDRK where a criminal will sit on death row for decades until he finally expires from natural causes. And where a criminal is entitled to have life saving operations such a kidney transplant or heart transplant to the detriment of law-abiding citizens who must wait in line for the organs. And where the current goobernator has announced that he will do his utmost to see that the death penalty, voted into law by an overwhelming majority of the voters of the state will not be carried out in his regime. And where a current senator and candidate for El Supremo de los Estados Unidos from the PDKR declared that she would not seek the death penalty in any criminal prosecutions in the “sanctuary” county and city of ‘Frisco when she was district mouthpiece and later attorney private first class of the PDRK. Instead of the slow motion, perpetual appellate process that passes for justice now, I think you will see swift prosecution and and imposition and execution of sentences once again. While bleeding hearts weep about the death penalty and staunch law and order advocates advocate for it, the one overwhelming truth about the death penalty is that, carried out, it irrevocably and absolutely eliminates recidivism. There are no two-time or three-time loser murderers. Hmm, what? 3 wives? Baptists do not allow more than one, and if he divorced one, he was gone. He sounds more like Jim Jones, the Marxist who swore to destroy christianity. I don’t think it would work any better after SHTF to use a “wench” that way… look up the definition. If she were built for deep mud and heavy hauling, it might work if you could cajole her into it. I have a feeling that in times gone by it was not that unusual for the woman of the household to assist in plowing and other heavy duty chores. Certainly in times when the man of the house was gone because of death or war the women had to assume the role of the male and perform the heavy chores that a man might perform. My maternal grandmother was left a widow with five young girls. She never remarried and I am sure that either she performed the heavy work around the household or it didn’t get done. She was left a widow in 1917, long before SSI, WICK AFDC and all the other aid programs that presently exist. She took in washing to provide subsistence and sometimes some of the girls had to be farmed out to relatives who agreed to care for them for a while until she could get things together again. That was washing before washing machines and dryers, so she scrubbed clothes in a tub using a washboard and hung them on a line from one apartment to another apartment to dry unless it was wet weather and then they got hung in the apartment. It’s amusing to confuse winch and wench, but for women before modern times, life was extremely tough. They worked at very hard labor from before dawn until late at night and frequently while pregnant. Both my grandmothers were left widows in 1917. My paternal grandmother was “luckier” than my maternal grandmother as she “only” had three young children left at home out of the seven children she bore. My maternal grandmother had five children all under the age of 10. There’s an old saying Man doth work from dawn till duck, a woman’s work is never done, till she layeth her head within the ark (coffin). I could use a Wench (will have to ask my wife for permission) and a Winch! Both are useful on the farm! Coffee grinders are mentioned, and the big industrial ones can grind grains too. This was an excellent source of information. So many items have been sold for scrap or entered into the collectors realm that are still serviceable. Rusty old cream separator parts can be re-tinned and are as good as new. My youngest brother used to move those items into any storage area he could find because somebody may find a use for them. Some tools you might not even recognize their function as these old intuitive fabricators thought of new uses of their junk. Enjoy the searching adventure. Boy, I bet the women are really going to be upset about this item. Farmers use the all-terrain vehicles to haul feed, square hale bales, to pull logs, and to hook a wench to for a series of heavy-duty work. While you’re out there, keep an eye out for the old post hole diggers that you turn to dig your hole; they can dig a shallow well with added plumbing pipe. I have a post hole digger that is two shovels joined together with a hinge. I don’t know which is harder work, a post hole auger or the shovel type post hole digger. I should sell it because I am way too old to engage in that sort of activity, but I guess I have a fond spot for it and all the holes I dug with it. My heirs will have to dispose of it. I wonder if they will even know what it is. Did holes by hand??? What kind of silly nonsense is that? Just go down to the rental yard and rent a gasoline driven hole digger. My husband and I dug a lot of post holes and the auger type is much easier to use than the ones with the two shovels. I don’t think you can buy them anymore. I have a post hole digger that is two shovels joined together with a hinge. I don’t know which is harder work, a post hole auger or the shovel type post hole digger. We have one of those out with the tools in the barn and it has been well used; but, not for many years. As a small framed lightweight guy, I found it to be annoying; but, easier to use than an auger, that mostly wanted to stick in the ground and spin me around. Locally you can still purchase them mew from Home Depot for around $35-40. I should sell it because I am way too old to engage in that sort of activity, but I guess I have a fond spot for it and all the holes I dug with it. My heirs will have to dispose of it. I wonder if they will even know what it is. I’m kind of the same with some of my old well used tools, like the draw knife, Adze, and Froe I used 40 years ago to make my own timbers from logs. Back then I had far more time than money (or brains LOL). As for my heirs, at least the boys would know what it was, since they were ”forced” to use it on occasion in their teens growing up on our rural acreage; but, they also got to shoot any time they wanted to in the back yard, so it all evens out. Exactly my thoughts now as I’m older, wiser, and more frail. Or better yet, have the neighbor come over with his tractor, three point & PTO. Been considering an M55 Stihl tiller….new about 300 bucks, found a perfectly good used one at auction recently for 35. Same auction bought a small barrel type concrete mixer, not so much because I needed a mixer, but because someone had recently replaced the original engine with a new 6.5hp B&S. It went for 25 bucks….engine alone is worth couple hundred. I’ve got a 1970 Massey Ferguson 135 with a Perkins Diesel and it’s built like a tank. Paid $1,300 for it and it was some of the best money ever spent! Love my Massey! I’ve got the manuals, can get parts… she won’t win any beauty contests… but I love her a lot!!! Our club had an old Ford tractor. It was very tired, so the work day chairman spent over $5,000 getting fixed up like new. When he was all done we had a running tractor that was worth about $1500. A couple more deals like the and our club would have been broke. He was replaced shortly after. LCC, This guy wouldn’t be a politician, would he? 🙂 They’re really good at spending other peoples money! Your auction is about 115 miles and 2 hours from my place; but, another nice; but, perhaps a bit smaller one is the Scioto Valley Produce Auction in Mount Victory, OH that is only about 15 miles north of me. Produce also includes spring plants by the flat for those not starting their own and they also have livestock auctions from chickens to cattle and occasionally some equipment. GOOD article. When I was a kid, pretty much everything on the farm, livestock and machinery, even a lot of feed, came from farm auctions. Dad learned electronics and mechanics by buying ‘junk’. If he didn’t know how to fix something, he’d go to the library and God bless, those ladies were a treasure. He would come home with an armload of books and pamphlets and read thru them. The very first tractor anybody in the fam owned was an ancient Cat, the smallest they made. The thing was already ancient in 1963 and everything frozen. It took him most of the winter, a few hours here and there, to take it apart and put it back together. Before he started it for the first time, he told us all to pray 🙂 It started the first time, and every time. A cousin bought it from him and it’s still running. butter churn: we were bootlegging dairy along with produce huckstering, and he bought one but had to rewire it. Librarians are a God-send. Same with the ancient well pump and trucks and cars. they were bought for pennies on the dollar because they were junk, but he and my older brothers learned by doing. One major thing to watch for is, horse-drawn equipment was often converted to tractor (the tongue shortened). Because tractors run faster than a horse, the equipment was often worn out. Back then, you could go to most junkyards and replace worn parts. Now, of course, you can send for them, but they’re not cheap. Yet, worth it! There’s an old story of an amishman who was getting ready for an action. He and his sons discussed what they wanted, and he talked with the wife what she wanted. as they readied to go, his little girl kept trying to get his attention, but he didn’t have time. When it came time to pay, he sent his son to the wagon for the nail keg. they open it and to their shock, it was full of nails. then the little girl gives Papa’s coat a hard tug. Angry, but not showing it, he asks her what she wanted so badly. “”Papa! I been trying to tell ya, Jonah brung the wrong keg!” niio! One little word goes awry and it opens up a whole can of worms. My turn! I suppose I could get a Wench to run my winch, while I do the hook-ups. Are there any good Wenches reading this, that would like to apply? I would like a spunky serving Wench type who would slap you back if you gave them a little slap on the rear as they walked by. Now where’s my grog? Get post hole diggers with metal handles and not wood if possible. Has a little more weight behind them and digs holes a little easier. Wood handles will eventually break. Will want to compliment the post hole diggers with a good sharp shooter shovel. Sharp shooter will loosen dirt and post hole diggers will get your depth. We would like to resell your books The Lost Ways! Can we buy them in quantity at a discounted price?